I hope you’re not tired of basil yet. Really, tired of basil? Is that even a thing? It’s like saying you’re tired of fresh peaches, or heirloom tomatoes or chocolate. Things that never happen. Never. I don’t know what it is about basil, but even with my giant, about to take over the front porch container, I still can’t get enough basil. Mostly because I can’t get enough pesto, but that’s another story. This love of basil eventually lead to this week, a celebration of summer’s most versatile herb- without a drop of pesto in sight. Not because I don’t love pesto. I could probably eat my body weight in it if I had to, but basil ALWAYS does pesto. So, I’m breaking out of the box to showcase my other favorite uses: peach basil iced tea, cauliflower pasta, panzanella salad, and to end the festivities, these basil summer rolls. I fondly like to think of these guys as kitchen sink rolls, mostly because everything and anything can go into them, and they will always taste amazing. Also, I like to eat them over my kitchen sink to allow for extra peanuty sauce to drip down my fingers. I like to keep a package of rice paper wrappers in the pantry at all times, especially when I have a produce drawer full of vegetable scraps. 1/2 a pepper here, 1/4 head of cabbage there, throw in 2 scallions, just chop up and add some basil and you are good to go. To make this more of a meal, I like to add fresh tofu. Baked would be delicious as well, but I love the mushy texture of fresh tofu. Pasta in the form of vermicelli, linguini or soba is a always a must for me because, carbs. And with that, basil week is officially a wrap! (See what I did there?) Hope you have an amazing weekend. I am more than ready to relax! We are heading to happy hour + concert in the park tonight- the perfect way to start a summer weekend. A light & healthy dinner for nights you don’t feel like cooking. 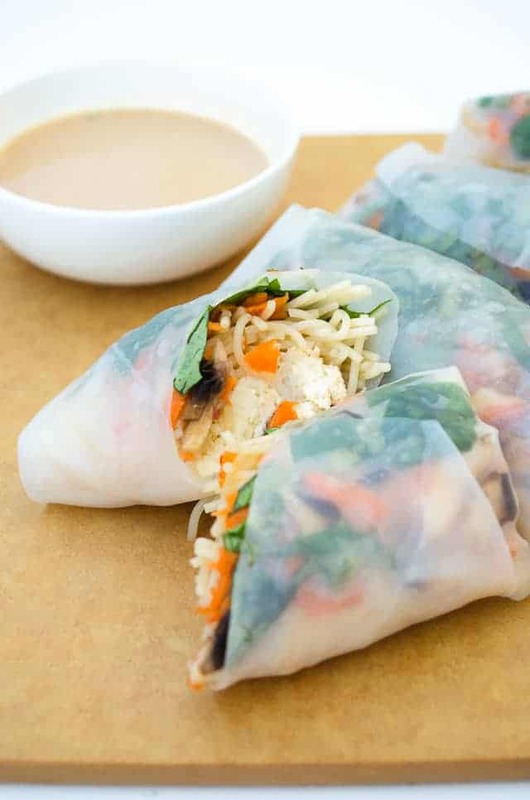 Spring rolls stuffed with fresh basil, tofu and vegetables with a spicy peanut dipping sauce. Makes 8 rolls, enjoy 2 as a side or appetizer, 4 as a main dish. Whisk together the sesame oil, sambal oelek, soy sauce, and rice wine vinegar. Toss with the thinly sliced carrots, zucchini and cabbage. Let sit for 5 minutes. Add warm water to a large shallow bowl. Place 1 rice paper in and let sit for until soft, about 30 seconds. Remove and place on cutting board or pastry board. Place 1 basil leaf in the center of the paper, a strip of tofu, and 1/8 of the noodles and vegetable mixture. Fold like a burrito: Fold the short end of the tortilla up so the contents don’t spill out of the bottom. Fold one of the long sides over the top of the filling. Place your fingers perpendicular across the fold, cup the tortilla over the filling and push the edge against the filling to make sure the fold is tight. Wrap the remaining long end over the folds. Set aside and repeat until all rolls are made. For the peanut sauce, whisk together the peanut butter, water and red pepper flakes. Yum! I’ve always wanted to make rolls but the thin paper intimidates me. I’ll have to give these a try! 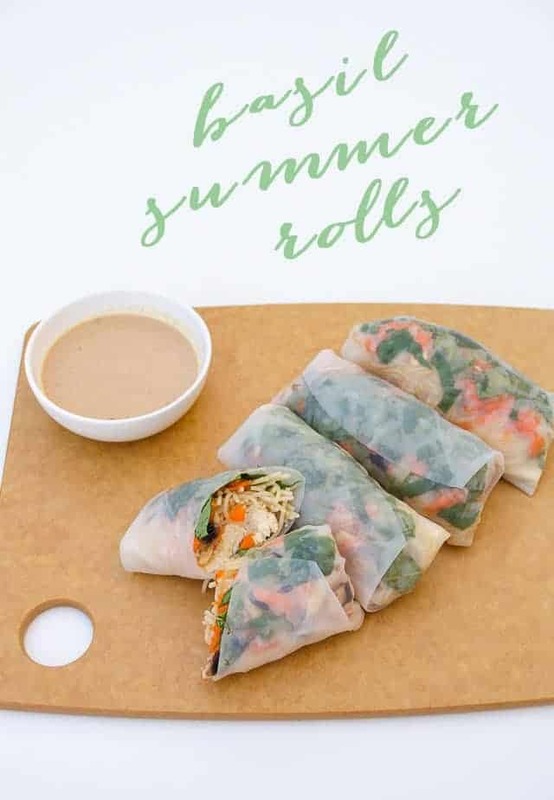 Summer rolls for the win! I can’t get enough of their texture. Also, Asian flavours with basil make my heart skip a beat. Love this recipe! Can you make these a day ahead of time? Needing something for a potluck and won’t have time the morning of. Thanks!